Within 250 miles of Chicago, IL. What does it take to become a high performance swimmer? At this swim clinic, your swimmer will learn the essential components of fast racing at an elite level from three-time Olympian Amanda Weir and Paralympian Tucker Dupree! Participants will work on underwater dolphin kicking, a strong core, and mental strength! Don’t miss out on this swim clinic where every participant will leave a faster and more confident swimmer. Take advantage of early bird pricing – Prices will rise as we get closer to the clinic! This curriculum for this clinic is all about the most important aspects of racing fast. These are the things that three-time Olympian Amanda Weir work on every single day in order to compete at the highest level. These skills include a tight core for a better body position in all 4 strokes, powerful underwater dolphin kicking, fast finishes, and mental strength. Body Position: All 4 strokes require a straight and strong body line with an engaged core! This allows for reduced drag, full-body connection, and a better body position in the water. Amanda Weir will work with each participant to teach them to hold their body in a way that will allow them to move through the water faster and more efficiently. This is one of the most important kills to constantly work on in swimming. Underwater Dolphin Kicking: The fastest swimmers in the world dolphin kick off of their walls far and fast! Learn from Amanda Weir how to establish a tight streamline and then whip through your core for a fast and powerful dolphin kick. If you do it correctly, underwater dolphin kicking is the fastest way to move through the water. 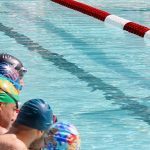 Learn the technique as well as how to know the right number of kicks for your swimmer! Finishes: Your swimmer will learn all about how to accelerate into the wall and time their last stroke to hit the wall with their fingertips and their arm extended. It is so important for all swimmers to keep their head down at least from the flags into the wall. Don't just expect to nail your finish at the meet; your swimmer will learn how important it is to finish strong and fast all the time, including practice! Mental Strength: A swimmer's biggest obstacle preventing them from taking their swimming to the next level is often found between their ears. Amanda Weir will lead a discussion on helping swimmers unlock their hidden potential by creating new positive thought patterns and learning effective goal setting strategies. What your swimmer learns in this session will be invaluable. See your swimmer become a more confident person in every area of their life! Swimmers and parents are invited to ask Amanda Weir questions during a Q&A session. Gain insight into her training regimen, diet and nutrition, and recovery tactics. Observe the Amanda Weir swim at full speed and demonstrate a progression of perfectly executed drills to achieve powerful, efficient and fast swimming. Practice what you've learned by taking your stroke to your top speed with one of the best swimmers in the world! Hold on to your form while having the opportunity to challenge yourself. Take a photo while wearing Amanda Weir's medals, get autographs, and receive a gift from our sponsors!